There are facial-hair looks that many men can pull off with style. The three-day stubble, as on Don Johnson’s Sonny Crockett, is still hot today (not so the pastel suits with tee shirts), as evidenced by Ryan Gosling. The full beard (Al Pacino in Serpico, Cat Stevens before he became controversial, my Russian Lit professor in college, my husband). The goatee, which can make some men look unsavory but make others (Brad Pitt, Blair Underwood) so savor-worthy. Then there’s the mustache — a look that peaked in the ’70s and then didn’t. A mustache doesn’t seem to work these days. It evokes images of a post-Woodstock, pre-Wall-Street, polyester-wearing era. And, in my opinion, should be left there. Except for one man. The only man, I think, who can continue to wear a mustache and make it look hot. 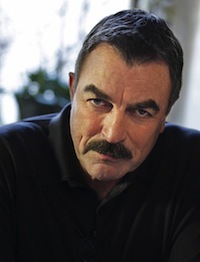 And that man is … (drumroll please) … Tom Selleck. Magnum, P.I. has morphed into Frank Reagan, NY Police Commissioner (Blue Bloods), all the while rocking that signature mustache. As well as lots of women’s worlds. It’s been a long, long time since a beautiful blonde urged men everywhere to “Take it off. Take it all off!” (see commercial here). If you’re reading this Tom, please leave the mustache on. When I met your father-in-law he had a mustache, but when we married and kissed alot it used to cause me to have a rash. So———, off it came. Just saying.!!!! !